Apps receive and handle events using responder objects. A responder object is any instance of the UIResponder class, and common subclasses include UIView, UIViewController, and UIApplication. Responders receive the raw event data and must either handle the event or forward it to another responder object. When your app receives an event, UIKit automatically directs that event to the most appropriate responder object, known as the first responder. Unhandled events are passed from responder to responder in the active responder chain, which is the dynamic configuration of your app’s responder objects. Figure 1 shows the responders in an app whose interface contains a label, a text field, a button, and two background views. The diagram also shows how events move from one responder to the next, following the responder chain. If the text field does not handle an event, UIKit sends the event to the text field’s parent UIView object, followed by the root view of the window. From the root view, the responder chain diverts to the owning view controller before directing the event to the window. If the window cannot handle the event, UIKit delivers the event to the UIApplication object, and possibly to the app delegate if that object is an instance of UIResponder and not already part of the responder chain. The view in which the touch occurred. The object that has focus. The object that you (or UIKit) designate. Controls communicate directly with their associated target object using action messages. When the user interacts with a control, the control sends an action message to its target object. Action messages are not events, but they may still take advantage of the responder chain. When the target object of a control is nil, UIKit starts from the target object and traverses the responder chain until it finds an object that implements the appropriate action method. For example, the UIKit editing menu uses this behavior to search for responder objects that implement methods with names like cut:, copy:, or paste:. Gesture recognizers receive touch and press events before their view does. If a view's gesture recognizers fail to recognize a sequence of touches, UIKit sends the touches to the view. If the view does not handle the touches, UIKit passes them up the responder chain. For more information about using gesture recognizer’s to handle events, see Handling UIKit Gestures. UIKit uses view-based hit-testing to determine where touch events occur. Specifically, UIKit compares the touch location to the bounds of view objects in the view hierarchy. 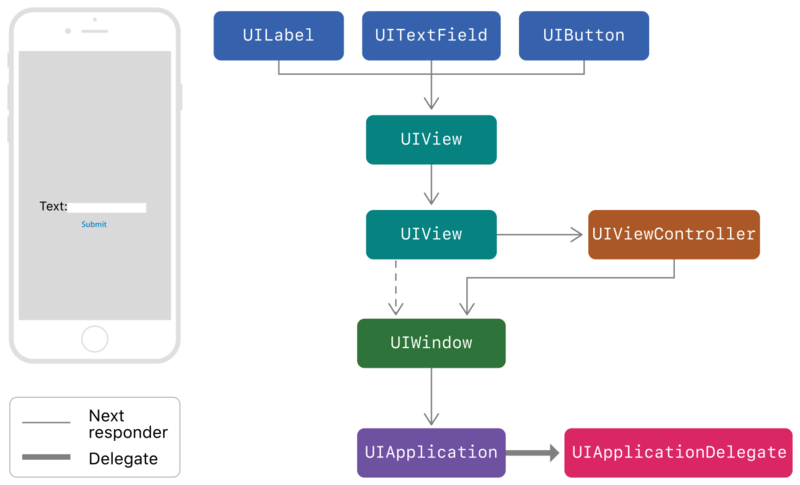 The hitTest:withEvent: method of UIView traverses the view hierarchy, looking for the deepest subview that contains the specified touch, which becomes the first responder for the touch event. If a touch location is outside of a view’s bounds, the hitTest:withEvent: method ignores that view and all of its subviews. As a result, when a view’s clipsToBounds property is NO, subviews outside of that view’s bounds are not returned even if they happen to contain the touch. For more information about the hit-testing behavior, see the discussion of the hitTest:withEvent: method in UIView. When a touch occurs, UIKit creates a UITouch object and associates it with a view. As the touch location or other parameters change, UIKit updates the same UITouch object with the new information. The only property that does not change is the view. (Even when the touch location moves outside the original view, the value in the touch’s view property does not change.) When the touch ends, UIKit releases the UITouch object. You can alter the responder chain by overriding the nextResponder property of your responder objects. When you do this, the next responder is the object that you return. UIView objects. If the view is the root view of a view controller, the next responder is the view controller; otherwise, the next responder is the view’s superview. If the view controller’s view is the root view of a window, the next responder is the window object. If the view controller was presented by another view controller, the next responder is the presenting view controller. UIWindow objects. The window's next responder is the UIApplication object. UIApplication object. The next responder is the app delegate, but only if the app delegate is an instance of UIResponder and is not a view, view controller, or the app object itself.